Fast relief for sore feet with Vita-Foam MT memory technology. Feel the comfort. Instantly molds like custom orthotics. Actual product weight is .5 oz. Try the insole that custom molds to your foot & arch! Relief from foot pain is here! CUSTOM FIT & SUPPORT Miracle Custom Molding insoles help relieve foot pain caused by the fit of your shoes & cushion tired achy feet, helping all your pairs of shoes feel like custom orthotics with custom comfort & support; lighter than most gel inserts. 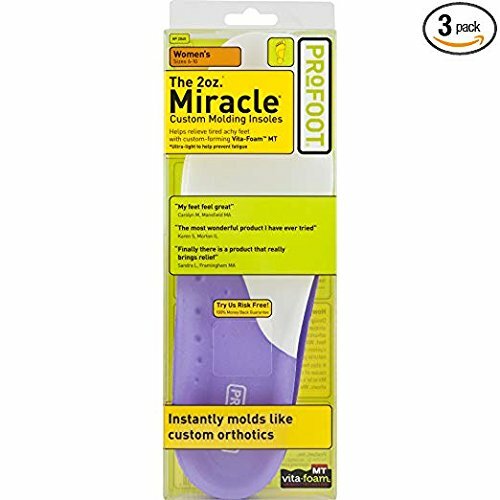 MOLDS TO YOUR FOOT Miracle Custom Molding Insoles insert into any shoe & mold to your foot for a custom, cushion fit that feels like a just-for-you orthotic & helps relieve foot pain or achy feet, supporting your feet for less foot pain & more comfort. ULTRA LIGHTWEIGHT custom molding insole with Vita Foam technology prevents fatigue & friction by molding to your individual foot for maximum comfort & support. Great for everyday use to keep away foot fatigue and fits mutliple types of shoes. Cut to fit. PROFOOT cares about footcare and healthy feet. Our foot care products are made to help you get relief from foot pain, including foot pain from injury, fungal infection, bunions, corns, calluses, blisters, cracked or dry skin & unsupported or flat arches.